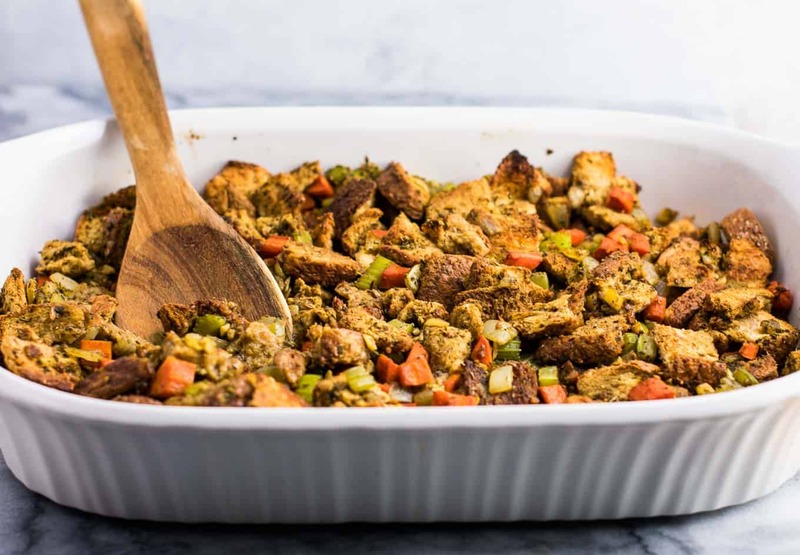 Today I am sharing my ultimate favorite vegan stuffing recipe – perfect for Thanksgiving and Christmas! I have never liked stuffing. Every year at Thanksgiving, I remember thinking it was just too mushy and I didn’t care for the flavor at all. It tasted like baby food to me. Then I grew up and started to learn how to cook things the way that I liked them. So this Thanksgiving I decided to create a stuffing worthy of eating…a stuffing that didn’t taste like mush! 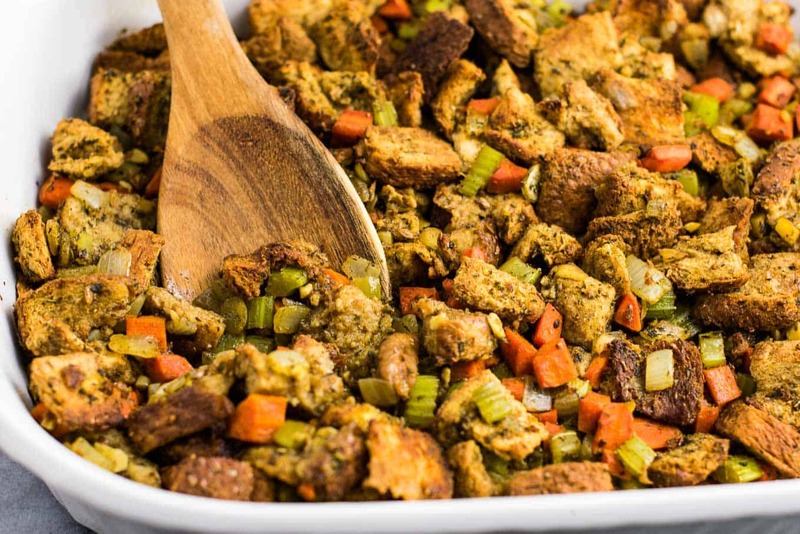 I have served this stuffing to meat eaters and to vegetarians and everyone cannot believe how much flavor it has! It is one of the most delicious vegetarian thanksgiving recipes I have ever made. 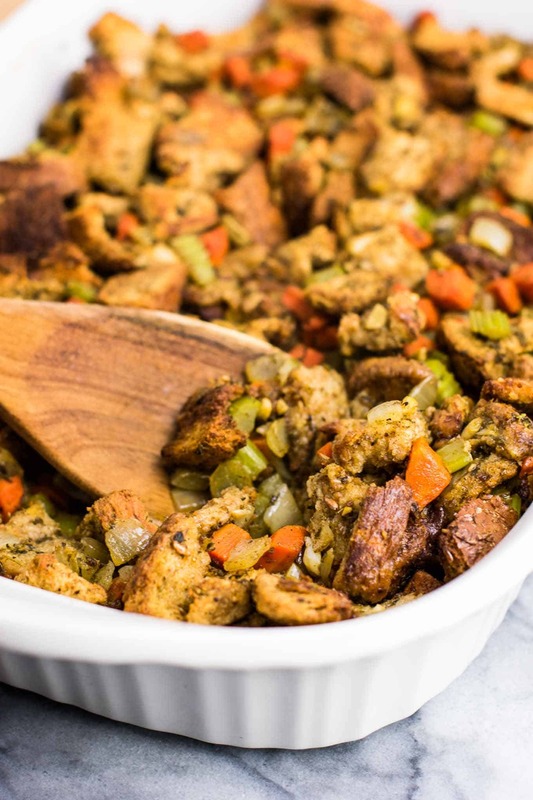 I had never made stuffing before, so I decided to just go with flavors that I know I loved, and really focus on the texture. That is key for this recipe. I fell in love with this recipe, it is the perfect amount of texture while still moist. It is not labor intensive at all, and the flavor is absolutely incredible! 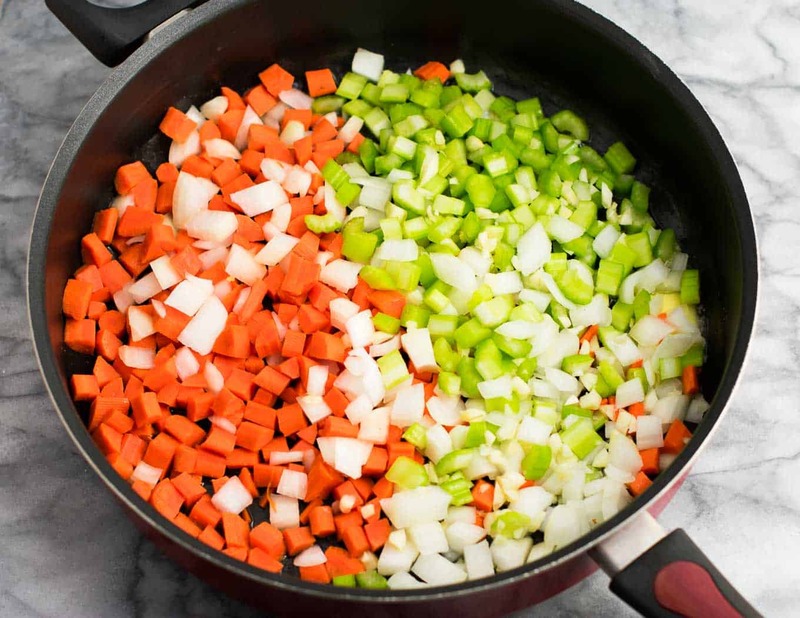 This stuffing starts off with a base of fresh garlic and onion, carrots, and celery. Fresh vegetables add great texture and flavor to the stuffing. Garlic and onion add a great base of flavor and I use so much of them every Thanksgiving. Every year I try to prep ahead as much as I can for Thanksgiving as there is just so much to do! 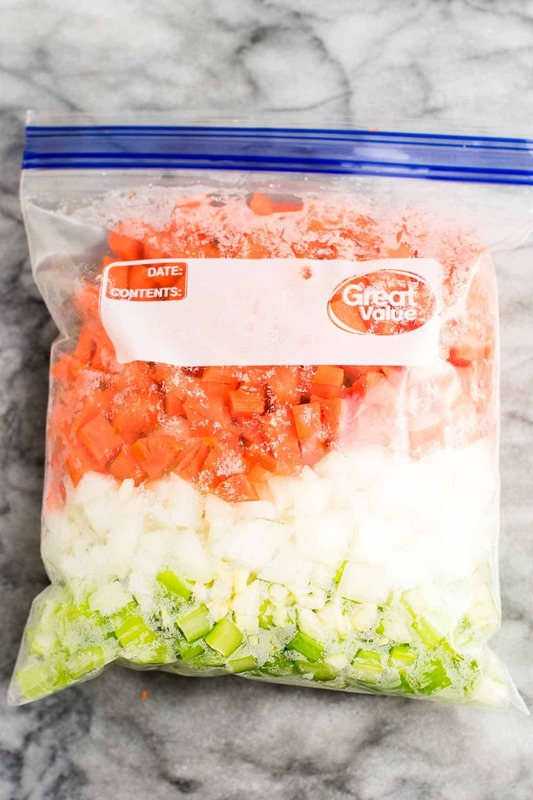 The day before, I will chop up the carrots, celery, garlic, and onion and put it in a ziploc bag in the fridge. This will make your stuffing go so much faster the next day! I’m all about making my life easier on Thanksgiving day. 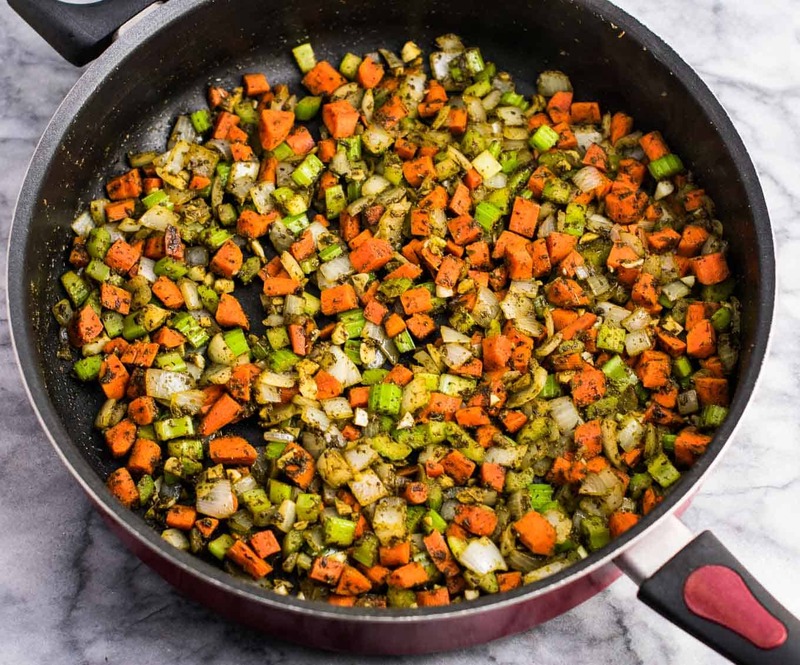 Once you are ready to make your vegan stuffing, add the veggies to the pan. You will need a very large skillet or pan. I use a jumbo cooker pan. I bought it from Walmart years ago and it has fast become one of my most used kitchen tools! Add in vegan butter, salt, sage, thyme, oregano, and pepper to the vegetables. Cook around 10 minutes, or until the veggies start to soften, but are not mushy. Cut your bread into cubes, and place on a baking sheet. Dry roast in the oven for 10 – 15 minutes, until it starts to brown. Check often towards the end to avoid burning. We want crispy bread, not burnt! Toasting the bread before adding it to the stuffing keeps it from turning to total mush – that is key here! To make your stuffing gluten free, all you have to do is use a gluten free bread. I almost always use millet bread which is gluten free, and it is delicious! Once your bread is done roasting, add it to the skillet along with the veggie stock. Transfer the stuffing to a large baking dish, then dot the top with vegan butter. Bake for 30 – 40 minutes, or until the top starts to brown. This stuffing is also delicious reheated which is usually not the case for stuffing that I have had before. Even just reheating it in the microwave it tastes great. 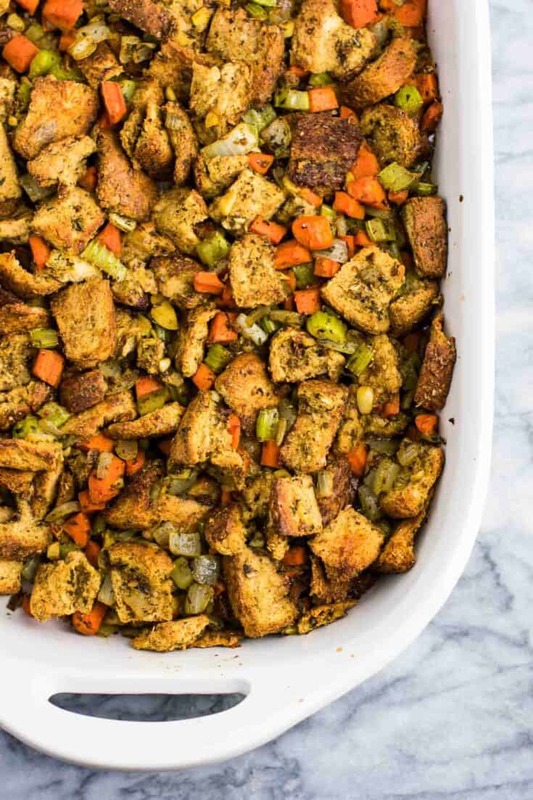 Ever since I first created this stuffing, I have made it every single year. I’ve made it for years now and have no desire to even tweak the recipe. I follow it exactly every year to guarantee it comes out perfect! The spices in this recipe are key and sage really is the star of the dish. I’m very happy with how this flavor combination turned out! Last year I served Thanksgiving dinner to my family who are not vegetarians, and everyone raved about the dishes! Here are some more of my tried and true Thanksgiving day favorites. Be sure to also read my best tips and tricks in this post: 17 best vegetarian thanksgiving recipes. This will be on my Thanksgiving table for many years to come! 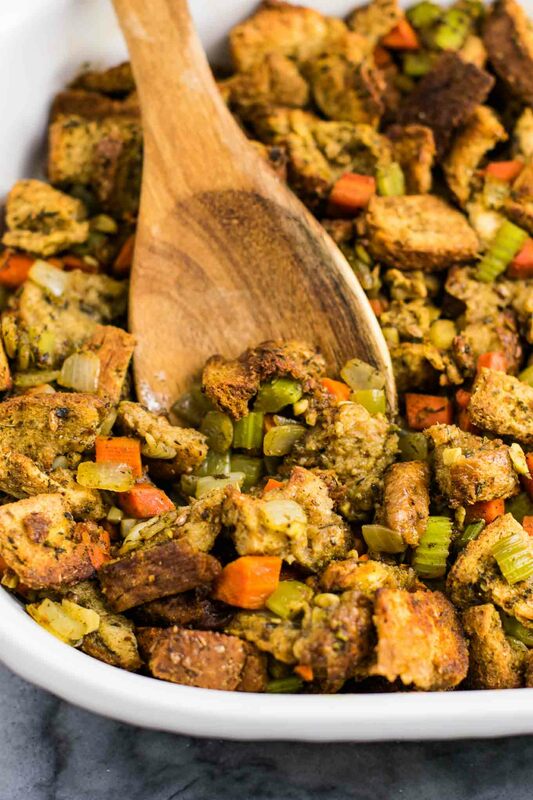 The best vegan stuffing recipe for Thanksgiving. Easily made gluten free, and everyone loves it! Stuffing is one of those Thanksgiving dishes that I hated as a kid too, mushy, soggy bread what’s up with that? But now I totally love it, I think that stupid stuffing in a bag stuff gives it a bad rap. Homemade is definitely the way to go, and your recipe looks so hearty I love those big chunks of bread! Hi Joy! Just discovered you while searching for healthy and yummy recipes. 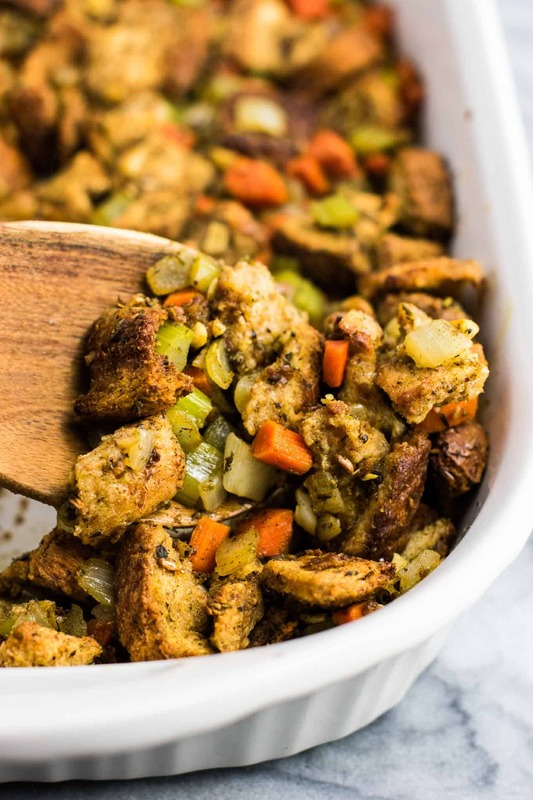 So this vegan stuffing recipe Does use ten garlic cloves? I’m just checking on that number before I shop and make it and serve to my Guinea-pig family! Thanks! I do use 10 cloves of garlic in this recipe (it ends up being around one medium head of garlic.) I really love the depth of flavor that it adds to the dish, but I don’t taste any “garlicky-ness” at all. If you think you may not want that much garlic, you could use half as much. I hope you and your family enjoy it! Happy Thanksgiving! Thank you Joy! I’m trying several of your recipes for our thanksgiving meal and can’t wait to enjoy them all. Doesn’t say amount of servings it yields. ?? I have to do for 50 people. ??? This makes a 9 by 13 casserole dish, so it serves around 8 people. I have updated the recipe to reflect this. Thanks! Just made this recipe for Thanksgiving and it was amazing! Thank you so much, definitely my favorite part of the Thanksgiving feast. So glad to hear you enjoyed it Chelsea!